Nearly 60,000 Connecticut children under age 6 were reported with lead exposure in 2013, and an additional 2,275 children had high enough levels of the toxin in their blood to be considered poisoned. While those numbers, the latest available from the state Department of Public Health, may seem high, health experts say they actually must be higher because of significant gaps in state-mandated testing. 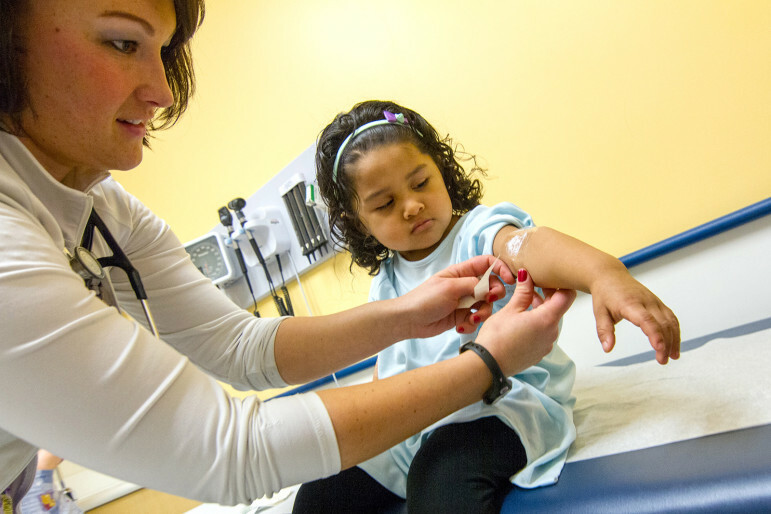 Three-year-old Angely Nunez watches as Lauren Frazer, a nurse at Connecticut Children’s Primary Care Center in Hartford, applies a topical anesthetic to her arm before a blood draw to check for lead levels. Even though Connecticut has some of the strictest lead-screening laws in the country – requiring every child to be tested twice, before age 3 – DPH figures show that only half were screened twice, as mandated. Unlike in Flint, Mich., whose residents were poisoned when a corrosive water source was directed through aging lead-lined pipes, the main culprit in Connecticut is lead paint. Though banned in 1978, lead-based paint is present in countless older apartment buildings and homes, especially in urban centers, such as Hartford, New Haven and Bridgeport. Connecticut’s “Requirements and Guidance for Childhood Lead Screening” set stringent rules on testing. State law says labs have 48 hours to inform the state and local health departments when they have a report of someone whose lead count is above a certain level. 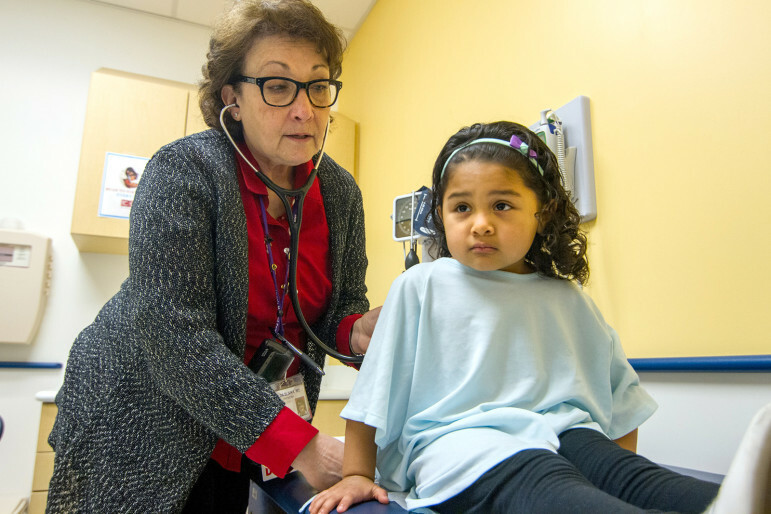 Most pediatricians are doing the screenings, said Dr. Lisa Menillo, who created and directed the regional lead treatment center at St. Francis Hospital and Medical Center in Hartford before it was closed in 2014. DPH numbers show that about 30 percent (more than 22,000) of children between 9 months and 2 years old did not have a blood lead test in 2013. And about half of all 3-year-olds that year who had been tested once when younger never had a second test. Screening “is a hard sell, sometimes,” said Lisa Honigfeld, vice president at the Farmington-based Child Health and Development Institute, which is under the nonprofit Children’s Fund of Connecticut. She posits that because Connecticut’s screening laws are stricter than the federal government’s, some pediatricians may not take the state laws seriously. This has spurred the institute to recently launch a training program to educate doctors on the medical imperative of following state lead laws. That’s not the case, she said. Young children are lead’s likeliest, and most vulnerable, victims. Their risk of exposure coincides with their peak period of brain development. Healthy babies and toddlers are driven to move and explore. Through frequent hand-to-mouth activity, they may ingest the toxin through peeling lead paint chips, which taste sweet, and lead dust, created as doors and windows in older housing open and close over the years, grinding down the paint. “Kids who are younger absorb lead at [many] times the rate adults will absorb it,” said Dr. Hilda Slivka, director of the Regional Lead Treatment Clinic at Connecticut Children’s Primary Care Center in Hartford. Lead exposure can cause cognitive deficits – a loss in IQ points – and speech and developmental delays, as well as hearing, behavioral issues and hyperactivity. KJ is held by his mom – Latasha Mewson of Waterbury – as his blood is drawn. But its immediate impact can be subtle or even imperceptible, since its symptoms are not uncommon: loss of appetite, fatigue, abdominal pain, constipation or diarrhea, irritability. Because its effects can be irreversible, lead exposure has long-term societal impacts, such as the millions of dollars spent on special education programs annually, experts say. In two recent studies, researchers at the Children’s Environmental Health Initiative, out of Duke University and the University of Michigan, examined lead-screening results and Connecticut Mastery Test scores, focusing on 18,000 fourth-graders. 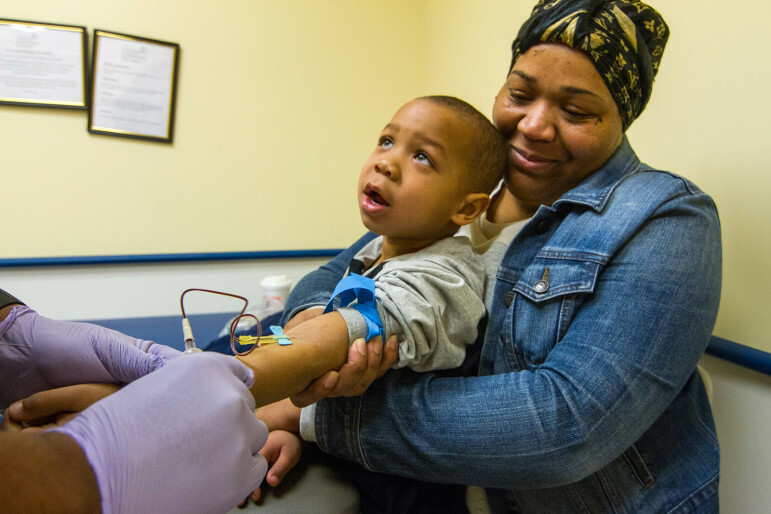 In both studies, CEHI said that the “stark difference between blood lead levels by race” – especially between white and black fourth-graders – was mirrored in the wide disparity in CMT scores in both reading and math. Since 2012, the Centers for Disease Control and Prevention and Connecticut health officials have defined lead poisoning as a blood lead level of greater than or equal to 5 micrograms per deciliter — although experts agree there is no such thing as a safe level. Once it enters the bloodstream, lead can affect the nervous system and nearly every other system in the body. Scientists say high levels can cause anemia, kidney damage, muscle weakness, brain damage and death. Without a blood test, pinpointing the cause of a child’s illness or condition can be difficult, in part because the toxin can affect children differently. “There isn’t necessarily one area of the brain that’s always affected,” said Slivka, of Connecticut Children’s Medical Center (CCMC). Lead exposure “can cause hyperactivity, it can cause some decreased ability in speech, it can cause decreased hearing as well as just [decreased] cognitive functioning,” Slivka said. Slivka runs a Tuesday morning lead clinic at CCMC’s Primary Care Center. The clinic gets one or two new patients every week, she said, and “a lot more” in the summer. Her current caseload is about 65 children, from Hartford, Manchester, Meriden, New Britain, Waterbury and elsewhere. It includes 3-year-old Angely Nunez of Hartford. On a recent Tuesday, Angely’s mother explained that when a fire forced the family to relocate quickly, they took an apartment on Buckingham Street, a stone’s throw from the state Capitol. Dr. Hilda Slivka examines Angely Nunez, 3. When staff at the federally funded Healthy Homes Program, based at CCMC, inspected the apartment in the fall, they advised the family to move. Angely and her parents now live on Park Street, but the little girl is still being seen at the clinic. Slivka said Angely has a speech delay as a result of the lead in her system. Waterbury resident Latasha Mewson had a more alarming experience with her son. When Mewson tried to enroll 3-year-old KJ into a new day care center last year, she was told they could not accept him because a blood test had shown his lead level at 47 mcg/dl. When, as required, the boy’s lead level was reported to the DPH and the city, the city inspected and put the family up in a hotel for three weeks, before placing them at their current address several blocks away. KJ is still being treated at CCMC. Slivka said it can take several years of chelation therapy – in which a substance to remove heavy metals is injected into the child’s body – to lower lead levels. • Waterbury had 4,152 children with a level of 4 mcg or lower, and 229 at 5 mcg or higher. • Hartford — 4,426 children with a BLL of 4 mcg or lower, and 161 at 5 mcg or higher. Although Hartford still has high numbers, Arlene Robertson, who has headed the city’s lead program since 1998, noted that the city is now No. 4 (behind Waterbury). “We have accomplished a lot,” she said, through education, in the form of literature and speaking to community groups, and by better screening. Nearly 75 percent of Connecticut’s housing was built before 1980, compared to 57 percent nationally, according to the National Center for Healthy Housing. This, and the fact that the housing is often in poor cities, makes the state one of the top 10 nationally in terms of lead poisoning risk, according to a 2012 DPH report. Removing lead paint, or lessening the risk of exposure, takes special training or its dangers can be increased. Since 1999, the U.S. Department of Housing and Urban Development has funneled more than $116 million to the state government and to cities and nonprofits for lead abatement and related activities. Since 2003, the nonprofit Healthy Homes Program, based at CCMC, has received $31 million from HUD to help property owners in 15 cities, where 62,000 children enrolled in Medicaid live, remove or minimize lead paint. “We can reach perhaps 200 houses a year,” he said. Of Bridgeport’s 58,500 housing units, more than 75 percent were built before 1978, when lead paint was outlawed. In 10 years, after four consecutive HUD grants, the city has remediated “almost 1,000 units,” said Sabine Kuczo, until recently the manager of Bridgeport Lead Free Families. Bridgeport’s most recent allocation, for $2.3 million, is aimed at making an additional 110 housing units lead free. Of New Haven’s 57,500 housing units, 83 percent are pre-1978, according to environmental health director Paul Kowalski. New Haven has remediated about 1,250 housing units. Which leaves, between the state’s two largest cities, more than 100,000 housing units to remediate. To view lead screening rates for children up to age 2 click here. Dr. Hilda Slivak discusses lead poisoning in our podcast, the Workup with Colleen Shaddox.